Note: The goal for the transplant has been met. Contributions coming in will be utilized for the well-being of the child post-transplant. My name is Samir Maity and I live in a small village in West Bengal. It was only two months back that I came to know that my younger daughter who is 5 months old now is suffering from cancer. When we heard from a local doctor that the treatment cost will be high, we didn't have an option but to take her home thinking it is her fate. But as a father you can't give up like that. My wife and I decided to find some way to treat my daughter. I work in a small shop and my wife is not working. I have an elder daughter who is 4 years old. With the help of my friends and relatives, I have managed to pay for her treatment till now. 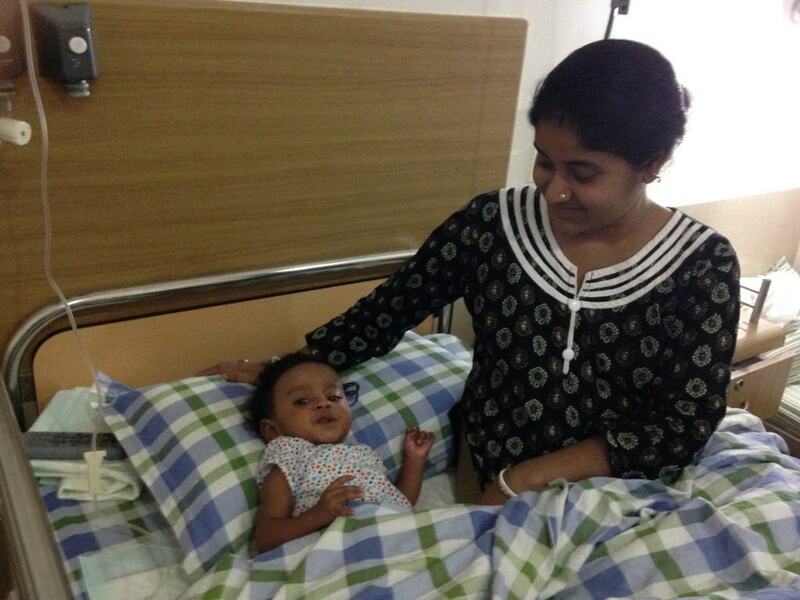 Referred by doctors at our place, we brought her to Apollo Hospital In Chennai. Sayani needs to undergo a bone marrow transplant to cure her cancer. We stay at a small place near the hospital. Doctors at Apollo have arranged for a matching cord blood unit from US for Sayani's treatment. We are lucky to have received this. Now all that is left is funds for the treatment. The estimation given for the treatment is Rs 30 lakhs. The letter is attached below. The only way to save my daughter is by your support. Please make a donation and support us. Sayani needs to undergo a bone marrow transplant immediately. 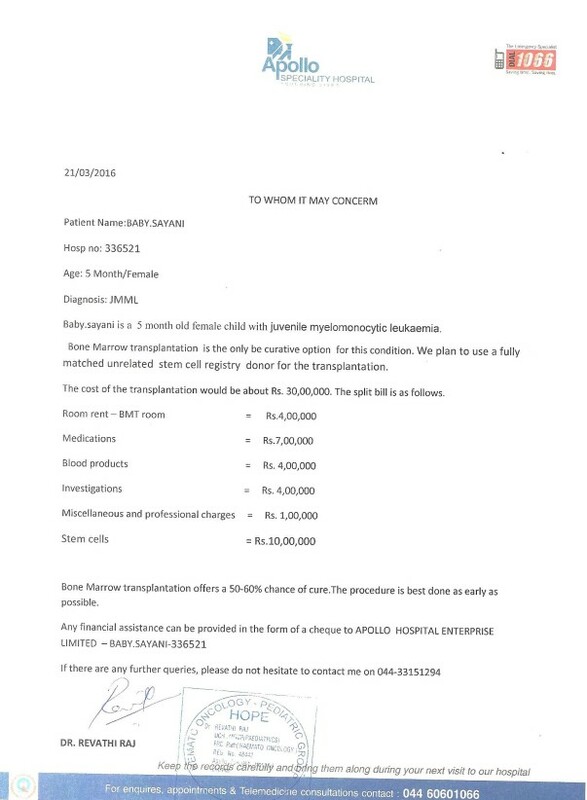 The cost of her cord blood unit from the US is in itself nearly 10 lakhs. Your contribution will help this father save his daughter. Funds collected will be transferred to the hospital upon receipt of invoices. I wish to place my sincere thanks to all the supporters who had helped Sayani in her battle with a life-threatening condition. She had a bad blood infection and passed away last week on Tuesday. I am really sorry that she could not make it despite all this overwhelming support she had received from supporters through Milaap. I place our entire team's thanks to you. Sayani's family has been staying in Chennai for the past few months for her treatment and to think of them back home in West Bengal without her is really hard. We hope the family finds strength at this time. Funds raised have helped Sayani to stay with her family till now. The remaining funds available in this campaign will help another child's treatment. We will keep you posted on this. My name is Howard and I work with the Community Team at Milaap. I paid a visit to Sayani and her family on Monday. 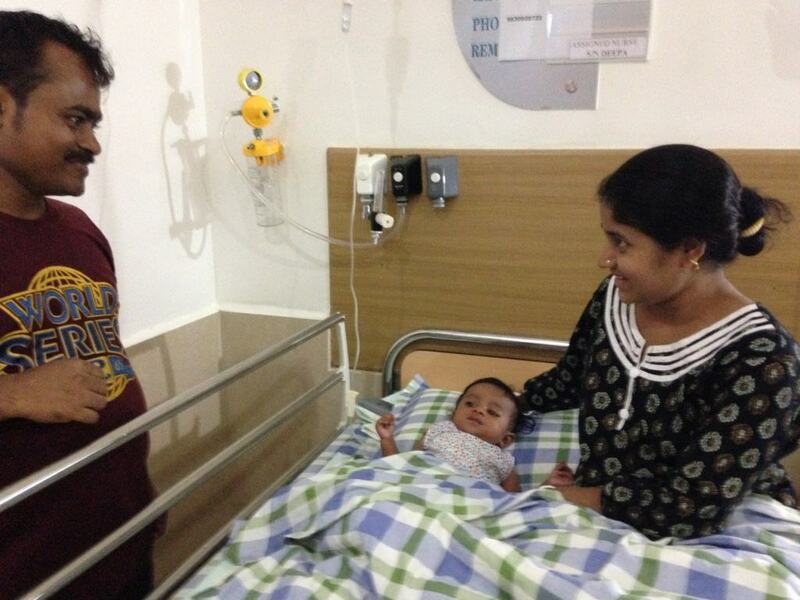 Sayani is admitted to Apollo Hospital in Teynampet, Chennai. Her chemotherapy session started yesterday and she is responding well to her treatment. Her mother is constantly by her side, tending to her care. The chemotherapy session will last for upto 5 days and this will be followed by the bone marrow transplant. Sayani’s father, Samir, has rented a small room near the hospital. He takes care of Sneha, his elder daughter and visits Sayani and her mother every few hours to check on their condition. Samir was moved with gratitude to know that complete strangers had donated to save his daughter. “I don’t know how I would have been able to pay such an amount without the help I received,” he said. “We are just simple folk and want our daughter to live a healthy life. When Sayani is better, I can’t wait to take her back to home,” he added, his voice filled with hope and expectation. We will be posting more updates as her treatment progresses. Thank you all for your amazing support, good wishes and prayers for Sayani. Thank you for your timely help. The response has been overwhelming and sayani's family is grateful to you. We have raised the required amount for the transplant. Contributions coming in now will be used for Sayani's post-transplant care as she will be under medications or will be used to help another patient after informing all the supporters. We just received an update from Sayani's doctor. Her condition has been stabilised with oral medication and she is free from infection. The hospital has found a fully matched cord unit for her bone marrow transplant from the New York Cord Blood bank which is the world's biggest cord blood bank. Doctors have managed to import the cord blood unit at a highly subsidised rate as the family is from a poor background.Transplant is scheduled for May 2016, as soon as the cord blood unit arrives in Chennai. Thank you for the support. We will share more updates in the coming days.